Although this particular era has ended, the circus lives on. Probably, as long as people continue to walk the planet, there will be a circus. Pascal Jacob explains why. The Circus: A Visual History tells the story of this peculiar form of entertainment and its many twists and turns from its ancient, even pre-historic, origins to the variety of forms that carry on the panoply of circus traditions seen today. 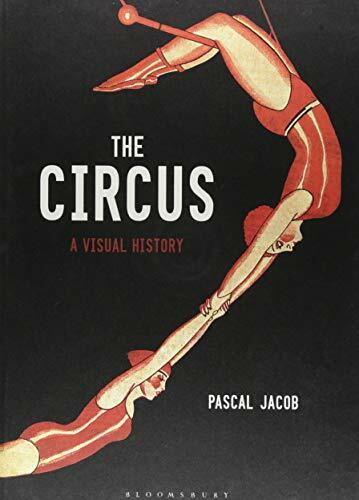 Part etymology, part gymnasium, part thespian, part zoological, and part visual arts, Jacob’s book, much like the circus itself, is inclusive, adaptive, and far reaching. Arranged chronologically, each of the four chapters segues into the next based on a new development in circus history. From antiquity to 1770, traveling gypsies, jugglers, and entertainers were the norm. Between 1770–1880 gigantic buildings cropped up to house acrobatics, equestrians, and elaborate pantomime dynasties. Changes from 1880–1930 included exotic costumes, wild animals, and big top drama alongside comedic clowns. Internationalization from 1930s–the present both expanded the circus acts and refined them back to their traditional roots. Through the chapters one begins to sense a pattern in the business of a circus: to give the people what they want to see. Consequently the circus organizers are constantly rewriting the pages of their script, honing their acts, and searching for the latest wow factor to enchant their audiences. Incorporating narrative story, choreography, special props, and the latest technology, today’s circus troupes and training schools bend gracefully to the tastes of their modern audiences, thus ensuring the future of such organizations. Writing in a light, readable style, Jacob tempers his historical knowledge into bite sized bits. He connects his thoughts clearly from section to section and uses illustrations to accompany his ideas. In fact, with nearly 200 photos, posters, and graphics, most of which are full-page or two-page spreads, the majority of the book’s 240 pages are indeed beautiful visual images, and the narration is kept to a minimum. What is missing amongst this magnitude of artwork is any real sense of the artists who produced it. The most information offered in this regard is a tiny blurb about the French painter and poster artist Gustave Soury (1884–1966), who specialized in circus animal art. With advertising in particular being of crucial importance to the circus industry, a bit more than scant credits would have helped round out the Visual History claim in the title. Jacob’s love and enthusiasm for the circus shines throughout The Circus: A Visual History. The rich vocabulary he uses is captivating and contagious. As when he poetically acknowledges that, “The heroes of this history are clowns and acrobats, adorned in sparkling rags and tatters so that, through a performance, their misadventures become transformed into moments of escapism and joy, both wonderful and fleeting.” He seems to be saying that as long as there is a world from which humans feel the need to flee, there will be a circus somewhere, even if not our old familiar Ringling Bros. and Barnum & Bailey, offering the desired respite. Cindy Helms has been studying art and art history since the late 1980s when she took her first classes in figure drawing and art history. She studied art, art history, painting, and design at DePauw Univeristy, the University of Denver, the Art Student League of Denver, Aurora Community College, and studied abroad in Vienna, Budapest, Prague, and Valladolid, Spain. She currently works as an artist and writes and illustrates children's books.